Since ancient Greece, this mutable fire sign has been associated with the mythological Centaur wielding a bow and arrow. The arrow is drawn and aim is taken even as the archer is in motion. Sagittarians will often be more focused on the target than what is right in front of them, and because of this they dream big, they make big plans, and they are eager to move, travel and charge ahead. An evolved Sagittarius knows how to leverage this drive into manifesting their goals by making sure that they are not overlooking important details, taking the time to recharge along the way, and having discretion about over-promising before their ideas begin taking shape. Their ruling planet is Jupiter – the big and benevolent planet of EXPANSION – corresponding to the Wheel of Fortune in the Tarot. The Wheel is another marker of time, of karmic cycles, and by meditation on our movement around the wheel, we can learn a lot about how to navigate different parts of cycles. For instance, when you are moving clockwise from the top, you can gain a lot of momentum, and when you are approaching the top once more as you ascend the other side, notice how much more effort it can take to get you up to twelve. The card seems to exemplify exactly what this sign needs to practice in order to evolve. This is the card of moderation, of stepping off of the path in order to strengthen oneself (as tempered steel) to process emotions (the pouring of water) and to bring the life back into balance (one foot on the land, one in the sea). In the Waite-Smith version of this card, we see Archangel Michael, with his solar disk and fire emblem, presented in a gentler, more feminine expression. Just as Temperance is defined as voluntary self-restraint, this is a symbol of active pause. What may at first be seen as a paradox, this idea of active passivity or active inaction can be thought of as purposeful, conscious or willed passivity, versus circumstantial or unconscious inaction. Take some time to meditate on the idea of active passivity versus passive passivity, and active reception versus passive reception. You might find here the difference between looking and seeing, and between hearing and listening. Temperance is one of the four cardinal virtues found in both Greek philosophy and eastern traditions. 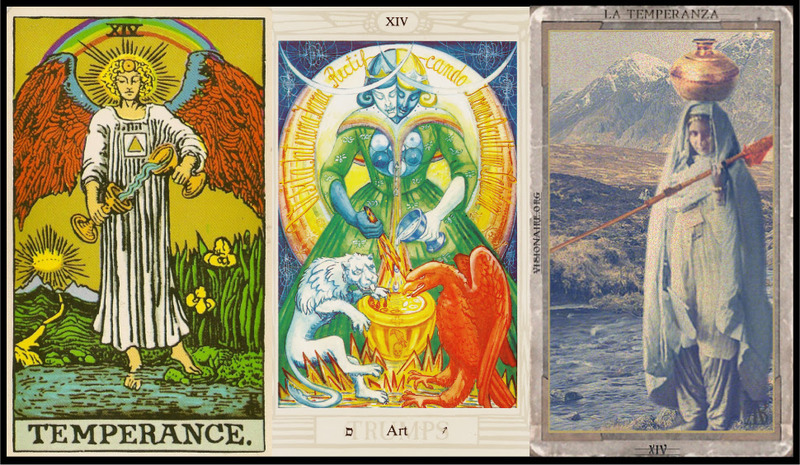 Three of the four virtues (Prudence, Justice, Temperance and Courage/strength) are depicted as Major Arcana in the Tarot. This virtue is personified as the ancient Roman Goddess Temperantia – pouring water from one vessel to another, and it is from her inspiration that the Temperance card imagery is drawn.